What does one do with a half full bag o' milk? Maybe pour it into a plastic container? Is there enough of a savings to warrant buying it in a bag vs. container? Pffff...clearly bags are the way to go. Sheesh. So, there are two sides to this debate, and the ones choosing the jugs are compensating. Too late to change your tune now, it's all documented on the forum. Hmmm, now who has been in favor of jugs, and what is there weak excuse? I might be all for the bags but they went extinct outside of eastern Canada 30 years ago! As an act of solidarity, I've started bagging all of my jug milk. Last edited by particlewave; 11-22-2016 at 02:34 PM. See, now doesn't that make way more sense? It just feels right, Steve. God intended milk to be in a bag. Just ask any cow where she keeps hers. Agreed! But Canadian beer. And I don't mean the Molson brand 'Canadian' or it's similarly tasting chief rival Labatts 'Blue' but something with a distinctive taste like Sleemans or Moosehead. Better yet how about Brador from Quebec. Tastes good and packs a punch at 6% Alcohol. Certainly would not put a non-Canadian beer in a bag. 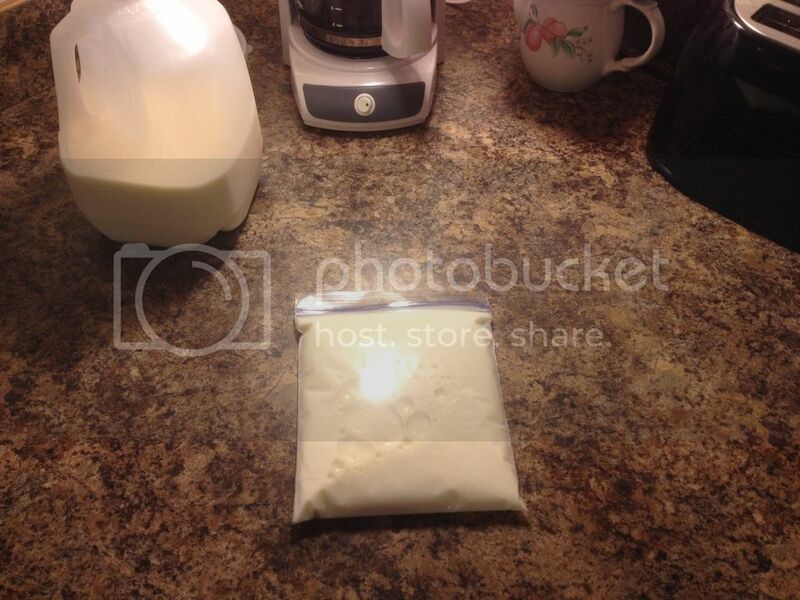 When I lived in Canada I found bagged milk very convenient. They are smaller at 1 liter(about a quart) and came in a bigger bag of 4, so about a gallon. You leave 1 or 2 in the fridge and they fit about anywhere, and you freeze 2 for later unless you drink a lot of milk. You have a sprecial plastic bagged milk holder that you put the bags in and snip off the corner. Either a big corner if you do heavy pours or snip a small corner for adding a douse to your coffee or tea. Oh yaa, the British pioneers brought tea, and since we were a colony of Great Britain until 1867 we are also tea drinkers, except perhaps for areas where the French explorers and settlers prevailed, although they mostly moved on down the Mississipi to Lousiana and created the Cajun peoples(French Canadians). Beer in a bag? I think the carbonization and pressures make that impossible as the bags would end up round like a bowling ball when you shake them up a bit. Most Americans have bowling ball bags though so maybe there's something to that if you could fit a tap in your bowling bag to dispense Canadian beer (Real beer). My first taste of US beer made me think my buddies pulled some kind of prank and watered down my glass of beer with dishwater. Sorry but thats not beer! The Europeans would say that Canadian beer is not real beer, and the UK would say that the European beer is not real beer, so I suppose its all relative. Last edited by jb92563; 11-27-2016 at 01:01 PM. Just got back from a trip to Sault St Marie Ontario. Couldn't stop thinking about this post when, as I strolled through the grocery store I found bags of milk. I'd never seen them before. I got some strange looks from other customers as I stood there laughing, remembering this thread. How the heck do you pour from and reseal a non-zip lock bag? And stand it up in the fridge, for that matter?